Not restrained by definite limits, restrictions, or structure. Allowing for or adaptable to change. Allowing for a spontaneous, unstructured response: an open-ended question. Except for that third point, that is pretty much the Salt Stack definition right there. Sorry for sounding like a salesman, but after using under 2 hours to build a simple XMPP gateway to control possibly thousands of minions, allow me to feel a little giddy. Let me demonstrate, here we go! I have used Prosody in a couple of projects earlier, it's very light weight and easy to work with, it will serve perfectly for this proof of concept. This demo uses two XMPP-users, one admin-account that will control the other account, used by the gateway. 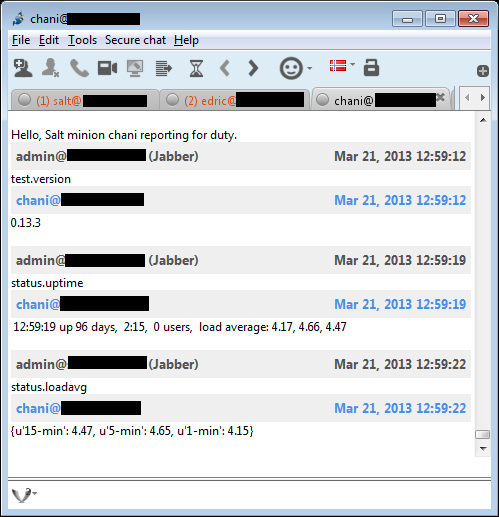 At this point you can log in with your XMPP client to admin@salt.demo.no to see if XMPP server is working. Salt API is a REST API for Salt, allowing you to interface with Salt over HTTP. For this demo I could have used python local-client directly. But using Salt API allows for separation of XMPP and salt, say if you want to build agents for thousands for minions, or just have nice separation. Note: This is just a demo, and not meant for production usage. The gateway script fires up a master bot and 1 minion bot for every minion. It will start off by trying to register a new account in-band for every minion and then send a message to the specified admin reporting in that it's ready for duty. The gateway has one command minions to list all the minions. All other text is treated as a function, e.g. test.version If you talk to a minion, it will run the command for that minion, if you talk to the master, it will run command on all minions. I have no idea on how this scales, as python will start a thread for each minion, eventually this will all break. My tests are for a small set of minions. Then I wrote a simple Salt REST API python client. It's inspired by the pepper utility that will eventually do that, but it's not finished yet. # call will return the error. print "Warning: unable to perform SASL auth. Old authentication method used!" print "Unable to authorize - check login/password."